In September, Facebook confirmed that the social network was testing photo synchronization on Android devices – a feature that has been available on apps like Evernote and Google+. Now that tech is reportedly in its testing stages for the iOS app, according to TechCrunch. Photos taken on a mobile device can be automatically uploaded to a photo repository hosted on Facebook’s desktop app called Synced for iPhone. The images that are automatically uploaded and hosted on Facebook are private and strictly for the user’s eyes only. Facebook allows up to 2GB of storage for any one user, which means that if the images that you’re uploading are 500KB, you can store fewer than 4,194 photos. The frequent smartphone “photographers” that hit the ceiling and run out of storage space can delete photos and have the peace of mind that sensitive images can be erased forever. If you suddenly aren’t feeling comfortable with instantly uploading images to Facebook, photo syncing can be turned off altogether. While Synced for iPhone can be used to store images, it’s also a quick solution to get your images from your phone and onto Facebook without the hassles of navigating to your iPhone’s Camera Roll, and going through the multiple steps to share a single image. 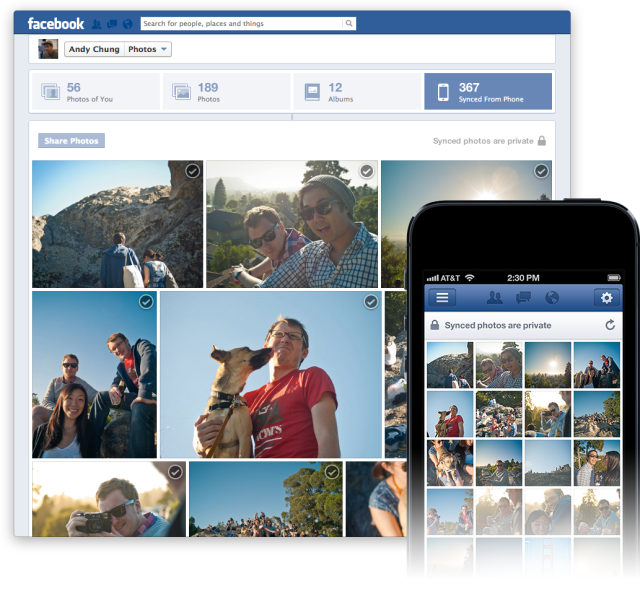 Packaged in the photo sync feature for Facebook is the ability to share multiple images at once as well. The photo sharing trend has been embraced by just about every social network out there so it’s a natural transition for Facebook to make the sharing process as seamless as possible. Of course with Facebook being Facebook, the social network had to tread carefully without tripping over wires that that would trigger attacks from privacy advocates — which this feature likely still will. Facebook will definitely have to make the off button big and bold when it comes with Synced for iPhone. Even if privacy advocates aren’t finding any faults with photo sync, uploading images to a social network, even if it is “private,” has its inherent risks. Anything uploaded to the Internet is never truly safe from prying eyes. That could mean your significant other figuring out your password, a hacker gaining access to your account, or you accidentally sharing a photo you never wanted the world to see thanks to your shaky fingers. At the end of the day, just be careful. 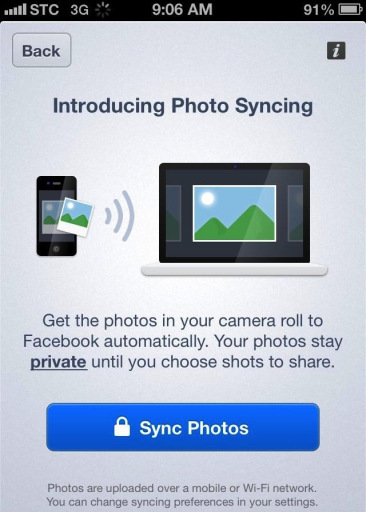 Synced for iPhone and photo synchronization isn’t publicly available to every user just yet. Facebook confirmed that the feature is being tested among select users for now and that there’s no guarantee that photo synchronization will be released publicly any time soon. To find out if you’ve been chosen for testing, navigate to your Timeline on the iOS app and select your “Photos.” At the very top of the page, you should see a button for enabling photo syncing. If that’s the not case then you’ll have to wait.